This series issued by the People’s Republic of China made of silver as a precious metal started in 1983 and the China Panda 1oz silver coin 2012 is the latest release belonging to this series. It is a beautiful series internationally famous. The face value of a China Panda 1 oz silver coin 2012 is of 10 Yuan and can come in different sizes from 0.5 troy ounces to 1 kilo silver bullion coin. The China Panda 1oz silver coin 2012 measures in diameter 39 mm which is slightly higher than other bullion silver coins issued by different countries around the world, which only measure in average 38 mm. It weighs 31.10 grams and has a purity of 999/1000, equivalent with 99.90% fineness. The China Panda 1oz silver coin 2012 illustrates the same design as the Panda gold coin issued in the same year 2012. The Chinese government issued a different design every year for its Panda coins, whether they are manufactured from silver or gold. The exception is the year 2001 which has the same design as 2002. Due to virulent protests manifested by investors and collectors, the Chinese government returned to their idea of a different design every year. The reverse of the China Panda 1oz silver coin 2012 depicts two lovely and heart worming Pandas, an adult and a baby Panda, among leaves of bamboo. The inscription situated above the head of the baby Panda is the denomination of 10 Yuan and at the bottom is the size and purity inscribed 1oz Ag .999. The obverse of the China Panda 1oz silver coin 2012 depicts the Temple of Heaven and at the top are inscribed Chinese characters that translate People’s Republic of China and 2012 the issuing year under the Temple. The idea behind these bullion silver coins is very attractive for collectors and investors alike. The Panda series, whether in silver or gold can be transformed into a beautiful collection of fuzzy animals, all in different engravers. And the China Panda 1oz silver coin 2012 surely belongs to such a valuable collection as the latest issue. Also collectors owning such a collection will eagerly await the design conceived for the 2013 series. 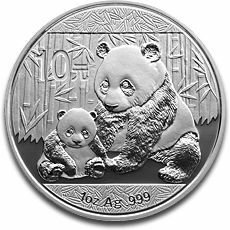 There is a small premium added to the price of silver when establishing the value of the China Panda 1oz silver coin 2012. As the price of silver increases, the profitability of this Chinese silver coin will increase. Also demand can increase the premium of the coin making it to be traded high above its bullion value. Investors should definitely orientate themselves towards investing into the China Panda 1oz silver coin 2012 because it is a liquid asset and extremely affordable because the silver market is not at its highest peak leaving room for a quantitative increase in the future. Those willing to perform an investment can acquire the China Panda 1oz silver coin 2012 from our website.